You may be surprised to learn that it's the simplest things people get wrong when they write. When you're creating an important piece of writing, every little detail matters. GradeProof has processed and corrected millions of documents, and this article explores some of the top grammar mistakes people make. Read below to find out the top 4 mistakes! Almost 17.5% of all documents processed through GradeProof had errors related to confused words. Often the errors occur when words or phrases sound very similar to each other (learn more about homophones in our article "Knowing your S#!T vs. Knowing you're S#!T"). The top oronym mistake is:"could of" -> "could have" or "could've". It is never correct to use "of" after a modal verb hence the phrase "could of" is never correct. People often make this mistake, as the phrase sounds similar to "could have" or "could've". The second most frequently occurring error is related to determiners. Determiners come before a noun or a noun phrase. 10% of documents analysed by GradeProof contain mistakes associated with their usage. The choice between "a" and "an" makes up large proportion of the determiner mistakes. The correct choice is determined (no pun intended!) by the leading sound of the following noun or adjective (i.e. whether it has a consonant sound or a vowel sound). Therefore, a word beginning with a vowel on most occasions take the indefinite article "an", while those beginning with a consonant take "a". The exception to this general guide occurs when some vowels are pronounced as if they were consonant or when the consonant "h" is not pronounced at all. This phrase has no subject and therefore is not capable of forming a sentence. I flew from Sydney to Melbourne. In this case, "I flew" is an independent clause as "I" is the subject of the verb "flew", hence the overall phrase becomes a proper sentence. These mistakes often slip through the cracks, as the phrase seemingly looks like a proper sentence that starts with a capital letter and ends with punctuation. There are, however, rare cases where sentence fragments are acceptable. Sometimes writers deliberately choose to use sentence fragment for dramatic effect. As long as it is within a clear context, and they are used intentionally and sparingly, they can be an effective technique to add variety to your writing. The fourth most common mistakes is disagreement between the Subject and the Verb of the sentence. These parts of the sentence must agree with each other in number, meaning a singular subject takes a singular verb, while a plural subject takes a plural verb. Of all documents analysed by GradeProof, 6% had Subject-Verb Agreement (SVA) errors. 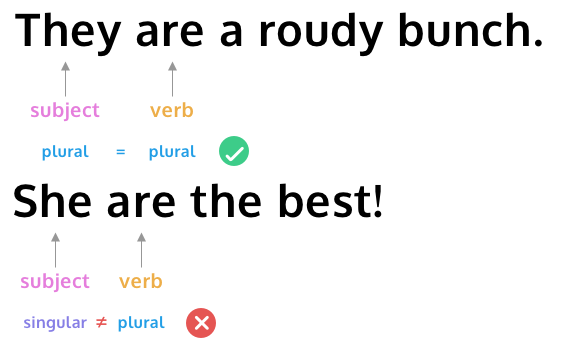 Some of more interesting SVA grammar rules include using a plural verb with two or more subjects connected by "and", and using a singular verb when subjects are connected by "or" or "nor". Hugo and Nick are racing for the title of the fastest runner. Either Craig or Matt is the best person to ask CSS questions. Proofreading to pick up these errors can be a difficult and tedious process. Powered by Artificial Intelligence, GradeProof detects and corrects your spelling and grammar mistakes as well as giving you rephrasing suggestions to improve the quality, clarity and eloquence of your writing. It is the essential writing tool if your impression and reputation matters. Are you using quotation marks properly?